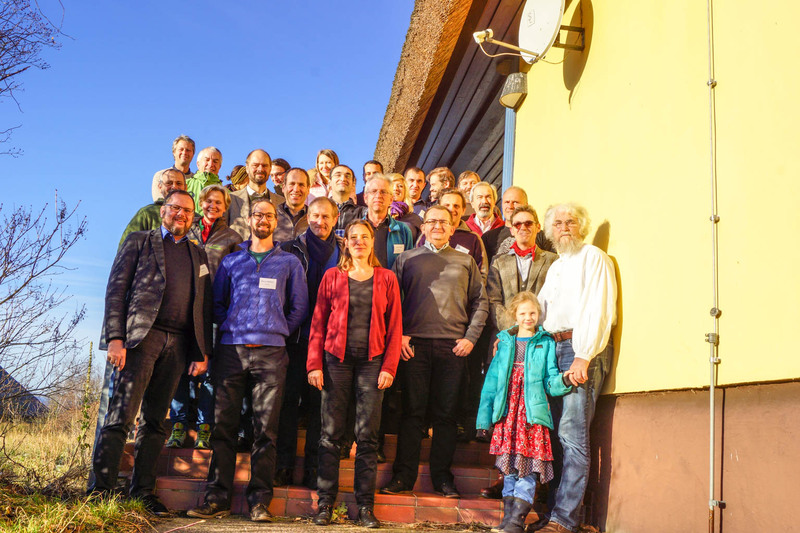 From 1 to 5 December 2016, 30 experts from 14 countries, who are dedicated to ecological research and the conservation of old and free-willed European Beech forest ecosystems gathered on the Isle of Vilm and conducted the second international workshop in this series. Anni Henning, Vlado Vancura and Max Rossberg attended on behalf of the European Wilderness Society and presented the new European Beech Forest Quality Standard Working Draft. The participants represent governmental and non-governmental organisations, academia, protected areas and civil society. The special environment on the isle with its well-protected old-growth beech forests provided unique inspiration to the participants. About 25 technical and scientific presentations provided most recent findings on ecology and conservation of beech forests as well as threats, risks and management issues. Various workshop sessions gave the opportunity for sharing knowledge, analyzing challenges and proposing concrete measures and steps to be taken. The group was informed about the recent successes made towards the extension of the serial UNESCO World Heritage Property “Primeval Beech Forests of the Carpathians and the Ancient Beech Forests of Germany”. The European Beech Forest Network acknowledges the efforts made by ten countries currently striving for inscribing further component parts, and again points out the potential of this pan-European initiative, highlighting the value of primeval and old forests without any interventions. The European Beech Forest Network regrets that Poland reversed the decision of the former government to participate in the extension nomination and expresses concerns about the future conservation of Polish old-growth forests. It recommends that Poland reconsiders its decision and reengages with the process. Participants expressed their serious concerns for the ongoing beech forest destruction in the Romanian Carpathians, and the European Beech Forest Network endorses the Memorandum “Scientists Call for Protection of the Primary Forest Heritage of Romania”. The workshop was implemented in parallel to the Conference of the Parties of the Convention on Biological Diversity in Cancún, Mexico. The European Beech Forest Network aligns its statements with the Cancún Declaration, from 3 December 2016, that explicitly renews the nations’ commitments to the conservation of forest ecosystems, amongst others being an essential element of cultural identity and worldview and providing valuable ecosystem services to humans. Beech forests are dynamic ecosystems and in times of rapid environmental change safeguarding their functionality is of vital importance to securing its adaptive capacity and resistance to disturbances. Scientific research reveals the importance of ecosystem continuity in space and time. Species, ecological processes and emergent ecosystemic properties are easily lost once the ecosystem is critically fragmented or degraded. Therefore, a network of appropriately connected free-willed ecosystems in a disturbance-low environment is a key condition for the survival and future evolution of beech forests. Correspondingly, the safeguarding of infrastructure-free and roadless areas is an urgent task, as much as is the active defragmentation of the landscape. The true ecological value of old beech forests can only be realized and safeguarded by considering the wider landscape. The free-willed beech forests provide vital regional ecosystem services essential to human wellbeing. They include climate and hydrological regulation as well as soil conservation. For both traditional and modern societies they offer an element of European identity. The values of the old beech forests go beyond commodity and direct benefit services in as much they have deep intrinsic value. Old beech forest ecosystems are appropriate reference sites and models for sustainable forestry practice. Climate change in combination with current land use practices is contributing to vulnerability of beech forests. Newly appearing pathogenic agents (such as Phytophthora species) pose serious risks to the survival of beech forests, which demands a better understanding how nature builds its own resilience, and this calls for greater space to allow beech forest ecosystems to operate dynamically and in a free-willed state. It is important to acknowledge the complexity and resulting uncertainty manifest in rapidly changing environments. Scientists and practitioners should avoid simplistic interpretations of current data and models that lead to risky decisions and interventions. Forest ecosystem management requires a fully integrated and participatory approach to planning and decision making. Raising public awareness and citizen engagement are integral parts of the process. The revision of existing forestry concepts and practices would be seen as an essential prerequisite to strategies for disaster and risk management. New strategies would draw on principles of eco-mimicry, including ecosystem-based adaptive management. Clearcuts and shelterwood systems are not considered to be compatible with ecological principles and conservation goals. A number of protected areas across Europe under their current management regime are not ecologically effective, particularly in cases concerning beech forests. There are noticeable differences in performance between countries, the current categories for protection lack consistency across the region. European-wide common standards designed to check the quality of beech forest conservation and management is called for. They would incorporate beech forest ecosystem functionality and policy proficiency checks, operating across spatial scales and from science to policy. The workshop participants agree to formalize the European Beech Forest Network as a registered association. The mission of the network is to promote and support the conservation of old-growth beech forests as well as the sustainable management of all beech forests; to raise public awareness of the importance of beech forest ecosystems; and to support the serial World Heritage Property dedicated to the old European beech forests. It also will develop and promote open standards for the quality of beech forest conservation and sustainable use. The European Beech Forest Network refutes recent statements about the negative effects of strictly protected areas located in central Europe on the biodiversity of other countries and regions. All countries must demonstrate accountability for all environmental problems and show commitment towards forest conservation and sustainability. Strictly protected free-willed ecosystems are needed everywhere. Countries must follow the principles of shared responsibility and mutual support. The concept of sustainability has to be rooted in ecological principles that describe the limits to growth, and not in the economically driven forces. Increasing development needs and the mitigation of climate change must not be an excuse for more aggressively using natural resources and abandoning the precautionary principles of nature conservation and sustainability. It is the global overconsumption of timber that has to be halted, not the protection of the very fundament of life. The workshop was funded by the Federal Ministry for the Environment, Nature Conservation, Building and Nuclear Safety and organized by the Centre for Econics and Ecosystem Management, Eberswalde University for Sustainable Development. The participants of the workshop see its accomplishment as another milestone towards an effective European Beech Forest Network. They acknowledge the efforts of the German government sponsoring the networking process and especially thank the International Academy for Nature Conservation on the Isle of Vilm for providing a unique framework for inspiration and productive work. Schulze, E.D. et al. (2016): Externe ökologische Folgen von Flächenstilllegungen im Wald. AFZ/Der Wald 15/2016, 24-26. Arguments on importance of Carpathian Wilderness in Ukraine!